Why do horses always roll in the mud five minutes before I get to the barn? Which is Best in Saddle Panels? Which is Best in Saddle Panels? Wool, Foam or Air? Courtesy of Gene Freeze, President, County Saddlery, Inc. Wool has always been the saddlers’ choice for flocking panels. Wool flocked panels are not assembly-line made with the one size fits all attempt in mind. Wool is extremely comfortable on the horse’s back and disperses the rider’s weight over a broader surface area, assuming the correct design and fit of the saddle. Because wool flock consists of “long individual strands” it can easily conform to the polymorphous shapes of the horses’ backs. Foam, regardless of how soft it may feel, does not compare to wool’s ability to conform. Wool can be easily adjusted to compensate for asymmetry in the horse’s conformation. Wool can be completely replaced in older saddles for relatively little cost. It provides stable support for the rider’s weight. There are no sharp edges. An often-heard criticism of wool by manufacturers who use foam panels is that wool knots up. I rarely to find knots in wool panels unless it is improperly flocked by a novice. If there are knots, they can easily be removed and replaced with fresh wool. Typically wool only knots when it is being removed from the panels. Note: Wool panels alone do not guarantee comfort for the horse and cannot compensate for a poorly designed or fitted saddle. The bad news is that wool panels need to be topped off or adjusted periodically to compensate for compression or changes in the horse’s back due to a variety of reasons including diet, training, age, season etc. The good news is that they easily can be! Foam preformed panels are made in molds and designed for more of an assembly-line production process geared toward speed and cost reduction. The problem is that horses’ backs are not preformed to match the panels. Foam does not conform to the polymorphous shapes of horses’ backs. It cannot be adjusted to compensate for asymmetry. Foam panels very often bridge in the middle even when the saddle appears to be balanced. Soft foam panels collapse and may create extreme pressure on the horse’s back and withers causing soreness. Harder foam panels often have sharp edges which bear most of the weight instead of distributing the weight over a broad surface area. Many foam panels are attached at the front with a covered nail which can dig into the back. They must be completely replaced when they collapse. When air panels first came out on the market, there was a lot of buzz and enthusiasm which lasted for a couple of years of trial. Many saddles were converted to air at a dear price and later reconverted back to wool. Although a clever and interesting alternative, they have failed to replace wool as the premium material for a variety of reasons. Air is unstable and tends to expand and contract as temperatures change. There have been many problems with leaking valves leaving the rider with a “flat” before a big competition. Unlike wool you can’t just compensate with a little more padding to get you through. As the rider’s weight goes forward the air tends to be forced in the opposite direction leaving the back unprotected. 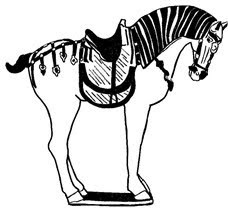 If there is too little air pressure, the horse's back may be exposed to the tree, and if there is too much pressure, the saddle often rocks on the horse's back. A Swiss study indicated that some riders reported a lack of communication and effectiveness via their riding aids when riding on air panels. Although both may suffice, the following information will help you make an educated decision. The question becomes which material is best suited for the job and why. Note on “Flexible Trees”: I have seen claims for trees which are so flexible that they can move with the horse’s movement. Although they may in fact move when the horse moves, they cannot possibly move in “concert” with the horse’s movement. To do so they would have to conform to a multitude of dynamic vectors and the exact speed and timing of muscle movements. Not even skin can do that, which is why skin slides. Saddle trees of any material, which are flimsy, are similar to insecure backpacks, they cause instability and discomfort. An improperly designed tree, regardless of the material, will be uncomfortable and hinder performance. A property often associated with plastic is the “creep factor”. The creep factor describes the tendency of plastic to be unstable and lose its shape over time or as a result of environmental factors. It is more problematic to test plastic trees before mass-producing them because of the cost to make prototypes to test. Too much vertical flexion or torsion can cause the tree to over-flex and injure the horse’s back. Too little does not allow for dampening of the forces applied to the horse’s back. Although there is a significant initial cost to produce a plastic mold, molding plastic trees significantly speeds up production and decreases cost to manufacturers. Because of the high cost of initially producing a plastic mold, there may be less incentive for the manufacturer to make changes necessary to correct faults in the mold or designs by producing another mold. Wooden trees are hand made from laminates such as beechwood, similar to the way wooden ships were traditionally shaped and manufactured. Vertical flexion or torsional rotation can be easily tested in wooden trees and corrected for by adding or reducing laminates in various areas. Although it is much more expensive and time-consuming to hand make wooden trees, design benefits make it worthwhile. Wooden trees made from laminates are generally considered to be more comfortable for both the rider’s and the horse’s backs. The term “Spring Tree” refers to the spring steel reinforcement of the tree allowing for dampening the pressure applied to the horse’s back while controlling the degree of vertical flexion. It does not mean, as I once read, that the tree springs up and down. Trees made from solid wood are referred to as rigid trees and are virtually never used in modern saddlery manufacturing. As the name implies they tended to be as rigid as many plastic or composite trees.